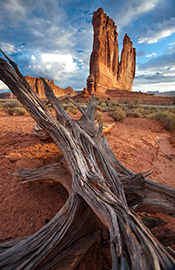 Utah's treasured and iconic landscapes—including Arches National Park, Canyonlands National Park and Dinosaur National Monument—are wonders that were formed by natural forces acting over millennia. The U.S. Supreme Court took action last week that did just that—endorsing an earlier conservation victory and ending the long fight over proposed oil and gas development on the doorstep of beloved public lands in the west. Utah’s treasured and iconic landscapes—including Arches National Park, Canyonlands National Park and Dinosaur National Monument—are wonders that were formed by natural forces acting over millennia. Tides moved back and forth across great water bodies over ages. Mountains were lifted up and ground down; sediments were deposited and scoured away. Those many steps were necessary to shape and refine what we value today. Similarly, our work to protect special places is often a lengthy process comprised of many steps (although not stretching for millennia!). We might begin with an administrative process, followed with litigation, followed in turn by an appeal. We are always fighting the good fight but the outcome may be not clear until the case has run its entire course. Along the way, there might be numerous ups and downs, challenges and opportunities that could not be foreseen. When we do reach the end, however, it is time to celebrate the victory and remember why we worked so hard. We are fortunate to find ourselves at such a point of celebration: the U.S. Supreme Court denial of a “petition for certiorari” in the Impact Energy v Salazar (Jewell) litigation closes the door on the efforts of a group of oil and gas companies and three Utah counties to force through 77 federal leases in the heart of Utah’s redrock country. Arches National Park, Canyonlands National Park and Dinosaur National Monument and other public lands will remain protected for now. The 77 leases, originally offered for sale during the twilight days of the Bush administration, were emblematic of the industry-first approach to public lands management that held sway through much of the last decade. As part of our ongoing work to protect special places against the onslaught of oil and gas development, Earthjustice and our conservation partners challenged the leases. Following a court order in 2009, Secretary Salazar scrapped the 77 leases after determining that the Bureau of Land Management had skimped on its environmental analysis and failed to adequately consult with the National Park Service. Industry and the Utah counties pursued litigation to force Secretary Salazar to issue the leases regardless of these shortcomings. We stood with the Secretary in defending the withdrawal. Although conservationists and the United States defeated the attempts to obtain the leases in both the district court and the Tenth Circuit Court of Appeals, plaintiffs pursued their quixotic quest all the way to the Supreme Court. The court’s denial removes the specter of air, water and noise pollution that the proposed development would have posed to cherished National Park Service lands. The Supreme Court’s decision is great news for Utah’s wild lands. The 77 leases were an ill-conceived, Bush-era give away to the oil and gas industry, and it’s high time the dispute over these leases was put to rest. This is a time to celebrate our victory and recharge but not to declare “mission accomplished.” Just as the natural processes that formed these landscapes continue to reshape and refine our natural wonders, our work to protect these places is not done. Many of the land management plans that determine the fate of our public lands remain flawed; indeed, Earthjustice continues to litigate over the Utah plans that allowed BLM to auction the 77 leases. The November 2013 Utah federal oil and gas lease sale includes more than 80,000 acres in the San Rafael Swell—another of Utah’s great treasures. For now, though, the end of this case has been a rare piece of good news over the last few weeks for those of us who care about our public lands. Your support of our work is what makes this report of good news possible. As I write this, Congress has ended the federal government shutdown and allowed for a return to normal for our national parks and monuments. Please get out and celebrate this victory by enjoying the redrock country or any of our public lands that are accessible to you!